Earny is a price protection application that uses receipts from user’s inboxes to find price drops on purchases, then under retailer and credit card price protection guarantees, claims refunds on the user’s behalf. The California-based company analyzed 100 million purchases in America between November 1st, 2017, and February 1st, 2018, to find the top-selling items in every state. The study produced some other interesting results including toilet paper being the most popular purchase in South Carolina, cat food in Minnesota and Karaoke equipment in Hawaii. 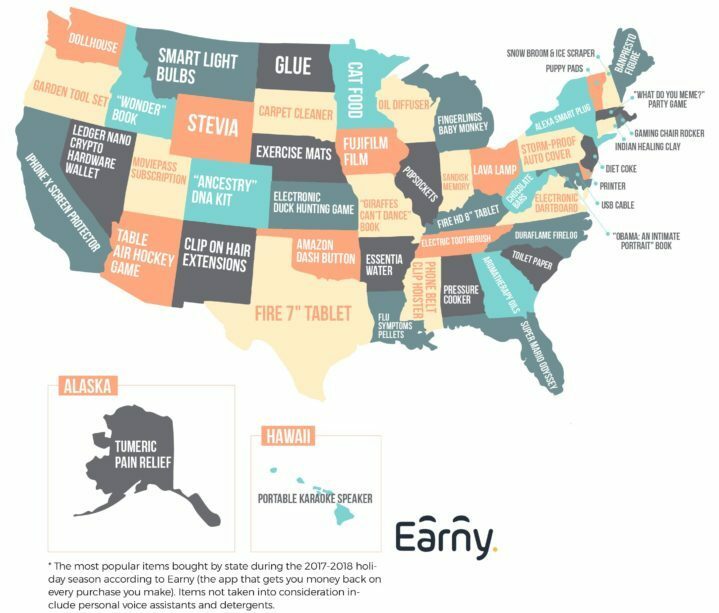 Other technology purchases included screen protectors in California, Amazon Fire tablets in Texas and smart light bulbs in Montana. 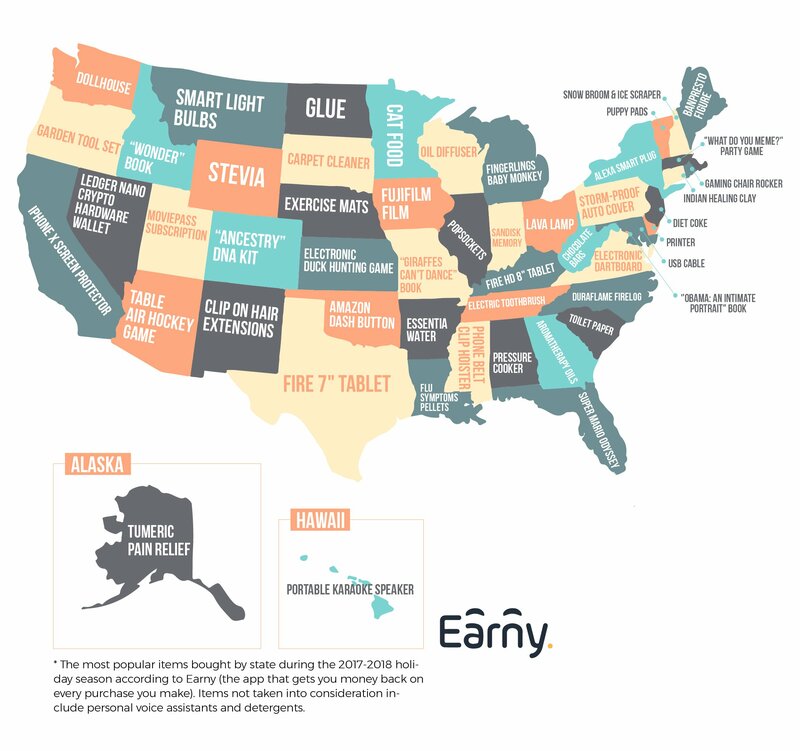 Earny did exclude purchases of Amazon Echo, Apple’s HomePod, and detergents as these were the most popular items in every state across the whole study. Even if you take into account that Earny users are probably not a proportionate representation of U.S demographics and that purchasers probably use Earny for items that often have price variations it’s still an interesting result. Ledger’s Nano S cryptocurrency hardware wallet gives extra security for storing cryptographic assets and making digital payments and competes in the market with Trezor and KeepKey devices. The result is not surprising if you consider that Nevada is considered blockchain and cryptocurrency friendly, having banned blockchain taxes and legally recognizing blockchain signatures and smart contracts. Nevada’s Emerald City is home to Google, Switch and Tesla’s $5 billion-dollar Gigafactory, alongside distributed ledger innovator and incubator Blockchains LLC. Blockchains bought a 67,000-acre plot of land in Emerald City in January. Nevada has no state income tax and Las Vegas is a popular location for blockchain meetups. Security is an also an issue in Nevada, a survey by internet security company Malwarebytes in December found Las Vegas was the most likely place in the U.S to become a victim of Bitcoin ransomware. Did you buy a cryptocurrency hardware wallet last holiday season? Does it surprise you that cryptocurrency gadgets are gaining ground in purchase studies, however, mixed the overall results are?